It’s definitely looking like Animal Crossing: Pocket Camp (Free) is going to be one of those games that is wall-to-wall events with little to no breaks in between. The Rover’s Garden Safari event just ended earlier today, and we’re already on to the next thing. Instead of catching butterflies in your garden, you’re going to be going after something slightly more seasonal. The Winter Sports Event is on, and it’s going to be even quicker than the last event, so you’ll want to get on it right away. The last event changed things up a bit, pushing players who may have been avoiding the new gardening feature to tackle it head-on. You collected seeds by helping out villagers, planted the seeds to grow special flowers, then tried to catch the butterflies that appeared around them. Those butterflies were traded to Rover in exchange for a variety of items. The schedule was a bit too tight, but it was kind of nice to be doing something different than the usual grind. Depending on how well you liked doing those extra tasks, this new event will either be a relief or regrettable. We’re back to the formula of the previous events, which means gathering up an extra type of material by doing the same old tasks for the villagers and using it to craft special limited-time items. This event takes advantage of the recently-added clothing-crafting feature, allowing you to exchange your collected snowflakes for sweet winter sports wear. Once you’ve got all the pieces, it adds up to a skiing outfit and a figure skating outfit. 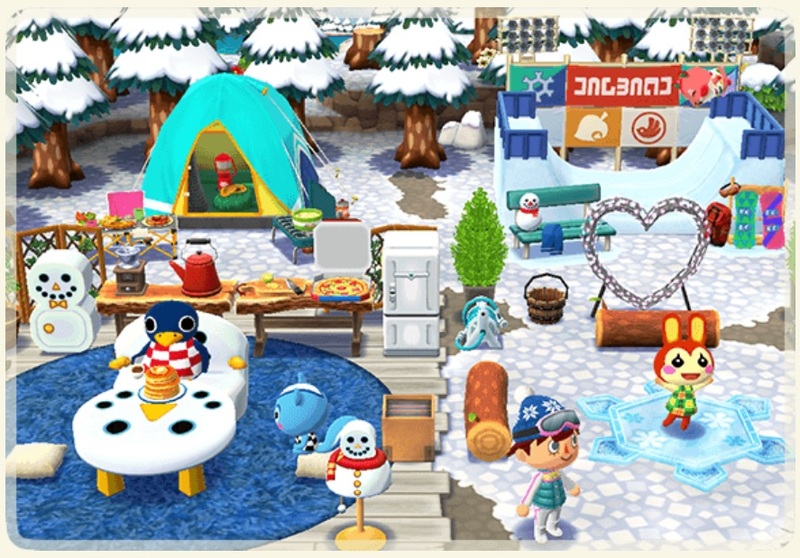 You can also get an interactive mini skate rink that the villagers will spin around on, and a new amenity in the form of a snow park that the animals will snowboard on. As I mentioned in the opening paragraph, this is going to be a quick one. It ends on January 31st, so you’ve got about a week and a half to gather everything if you want it. If you need a little head start, Nintendo’s selling an IAP that includes 20 Leaf Tickets and 25 snowflakes for $0.99. That’s not really a lot of snowflakes, though, so you might as well just play the game if you really want the goods. Either way, you’ll have to hustle if you want to adorn your campground and avatar with the finest winter gear.